Appearing as the last of four similar products from the US Mint in 2007, but only the fourth for the program as a whole, was the 2007 Madison $1 Coin and Medal Set. Examples of two different programs from the Mint were included in the set. 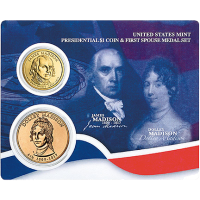 A James Madison Presidential $1 Coin represented the circulating Presidential Coins and a Dolley Madison bronze medal represented the First Spouse Gold Coin series. Both of these programs debuted in 2007 and are issued on a schedule linked to the order in which the President served in office. As Madison was the fourth President of the United States, his coins (as well as the coins and medals of his wife Dolley) appeared fourth from the Mint. The authorizing legislation (Presidential Coin Act of 2005) dictates that if the President was not married during his term, then an image of Liberty will be used on the Spouse coins and medals instead. This is the case with the above Thomas Jefferson Liberty Medal. His wife passed away nineteen years before he assumed the office of President. The Madison Coin and Medal are each mounted in a plastic card showing colorful images of both honored person. The United States Mint released the Madison Coin and Medal Set in 2007. Joel Iskowitz designed the obverse (heads side) portrait of James Madison found on the Presidential Coin. It was sculpted by Don Everhart. Everhart also designed and sculpted the reverse (tails side) image of the Statue of Liberty which is found on all of the Presidential $1 Coins. Don Everhart also designed and sculpted the portrait of Dolley Madison featured on the obverse of the Spouse Medal. For the reverse, Iskowitz and Everhart teamed up again to show Dolley in the White House insuring important papers and paintings are saved from the White House before it is burned by British Troops in the War of 1812.